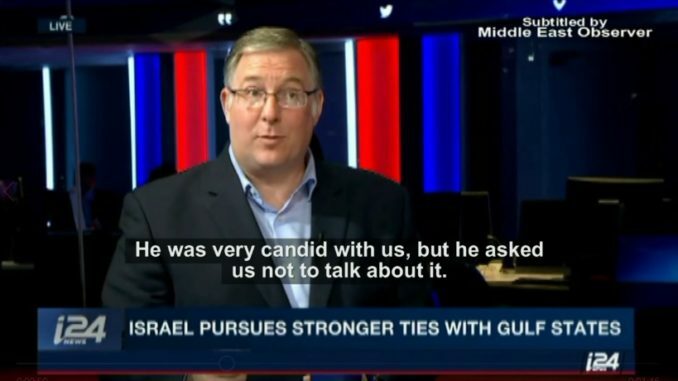 American-Israeli Evangelical leader Joel Rosenberg reveals what Saudi Crown Prince Mohammed bin Salman told him and his delegation regarding Saudi-Israeli relations in a ‘historic’ meeting in Riyadh on November 1, 2018. Rosenberg, who is an Evangelical Christian with Jewish ancestry, said he was invited to Riyadh for an official visit by bin Salman. The Evangelical leader has written several US best-selling books about Israel, Islam, and ‘jihad’, according to his website. I want to ask you then a little bigger picture, something we follow very closely here on ‘The Rundown’, is the Gulf, the Middle East, the relationship both with the United States and with Israel. There’s a lot of buzz about a so-called warming between the Gulf states and Israel. We saw a series of very public visits over the last couple of weeks, very unusual. Both in your time in the UAE and in Saudi Arabia did you get a hint of that? We spent quite abit of time asking him about Arab-Israeli relation questions, and Saudi-Israeli questions…we can tell you what we told him, but this was the only topic in two hours of conversation that he said ‘I’m asking you to not go out and repeat the conversation’. He was very candid with us, but he asked us not to talk about it. You did discuss it, you just can’t repeat the content of that discussion? We did, we did…and we said there’s three things you need to know as you build a relationship with Evangelicals. In America there are more than 60 million Evangelical Christians. The number one thing we want to talk to you about is that how much Evangelicals love Israel and the Jewish people. It’s important that you know that, as you think about this region. Second, Jesus commanded us to love our neighbour, and the Palestinians are our neighbours, so it’s not that we love one and we don’t love the other. We want life to get better for the Palestinians. We’re not coming to you with a plan, but just know that as a value. Without revealing then the contents of what he said as you promised him, can you describe whether you were surprised at what you heard from the powerful Crown Prince of Saudi Arabia on the issue? Yes, and there was just one more piece that we said: 60 million American Evangelicals are looking, praying, who will be the next Arab leader to make peace with Israel? Now I will say, since I can’t talk about what he actually said: the fact that we were there, number one. The fact that I was there. I said to him look, I was born in April of 1967, at a time where the Arabs were saying let’s throw the Jews into the sea. Right, let’s wipe out Israel. So the fact that I’m sitting here, as a Jew, as an Evangelical, as an Israeli, as an American – that’s a mind boggler – but still, it’s touching to me, because I never imagined this. I think it’s one of the signals that we’re moving in the right direction. Okay Joel Rosenberg, a fascinating window into a very rare opportunity in the Gulf.